The Wheeler—Schebler Carburetor Company was one of the city’s most important auto parts makers of the early 20th century. From 1911-1951, workers in this factory produced carburetors for over 15 makes of autos nationally. Frank Wheeler and George Schebler formed a partnership to manufacture George’s carburetor, patented in 1902. Wheeler was the financial expert, while Schebler had the engineering skills. The two business partners sponsored the Wheeler—Schebler Trophy, a Tiffany-designed silver urn for Indy 500 winners and a precursor to the present Borg-Warner Trophy. The plant housed both manufacturing processes and administrative offices. 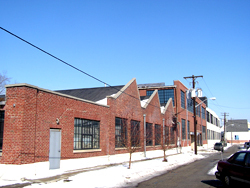 Local architects, D.H. Bohlen & Son in collaboration with Herbert Bass, designed the north portion of the factory in 1911-12. Additions continued extension of the plant to the south in 1919 and 1928. The 1928 section has the typical saw tooth roofline of many early industrial plants. The Wheeler—Schebler Plant is one of the last automobile parts factories in Indianapolis to survive from the first decades of the twentieth century, when the city played such an important role in the manufacture of automobiles and automobile parts. In 2001-2002, Southeast Neighborhood Development Corporation rehabilitated the complex using the federal historic preservation tax credits. The innovative use combined loft apartments aimed at artists with exhibit and performance gallery spaces, while preserving many key elements of the buildings. Wheeler—Schebler Carburetor Company, now Wheeler Arts Community, is located on the near southside at 1035 East Sanders St. The exterior is visible from the street; the interior is open for shows and exhibit openings. Consult Wheeler Arts Community for information on events. Visit nearby Fountain Square Historic District. INDYGO bus line from downtown: #14 Prospect, disembark at Prospect.